Home Android Mobile Mobile SIM Card Samsung Mobile Smartphone What type of SIM Card does Latest Samsung Smartphones Supports? 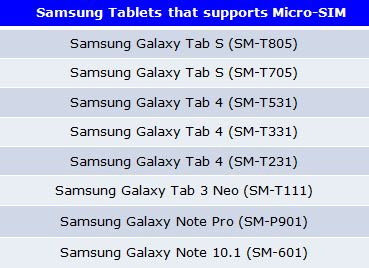 ● Micro Sim is currently being used in latest Samsung Smartphones such as Samsung Galaxy S5 (SM-G900H), Note3 (SM-N900), S4 (GT-I9500) etc. 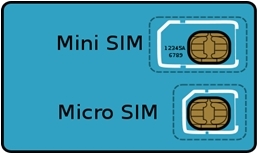 ● The Micro SIM aka 3FF is the newest generation of SIM card which is smaller than the conventional SIM card currently available that is only 12mm x 15mm or 52% smaller than regular SIM card (25mm x 15mm). To compare the size of both types of SIM Cards, refer the above picture. ● Micro SIM cards also have several advantages that have nothing in common with regular SIM, such as the addition of a new PIN to make it more secure and additional columns in the contact data for email, second name and group. 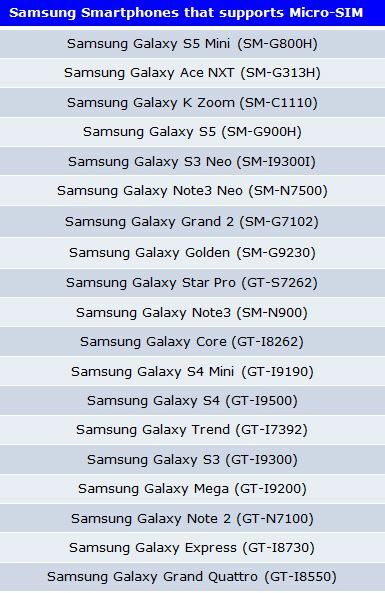 NOTE: Samsung Galaxy Grand Duos (GT-I9082), Galaxy SII Plus (GT-I9105) and Galaxy S Duos 2 (GT-S7582) supports Mini SIM.